Apple's CEO just got even richer. Tim Cook has been granted 560,000 restricted Apple stock options and, to celebrate the windfall, he’s cashed in $58 million. As revealed in an SEC (Securities and Exchange Commission) filing, Cook was awarded his stock options on Friday, valued at around $120 million. However, approximately half of these were withheld as the result of statutory tax withholdings on vested stock options. Cook then sold the remainder in trades on Monday with an average selling price of around $217.50 perr option. As I wrote last week, Cook’s 560,000 shares were split into two separate awards. These included 280,000 shares for his continuing work as Apple CEO, and an additional 280,000 shares which he would receive only if Apple’s stock market return for the previous three years was better than two-thirds of the other stocks listed in the S&P 500. In the event, Apple’s performance ranked 50 out of 423, meaning that Apple easily made the cutoff. Cook’s next stocks to vest will take place on August 24, 2019. In total, he has a massive 2,380,000 restricted stock options remaining in his contract. In other words, don’t expect Tim Cook to go hungry any time soon — even if his current net worth of approximately $758 million is a fraction of Amazon CEO Jeff Bezos’ $143.1 billion fortune. Tim Cook has said that he plans to give his entire fortune to charity. 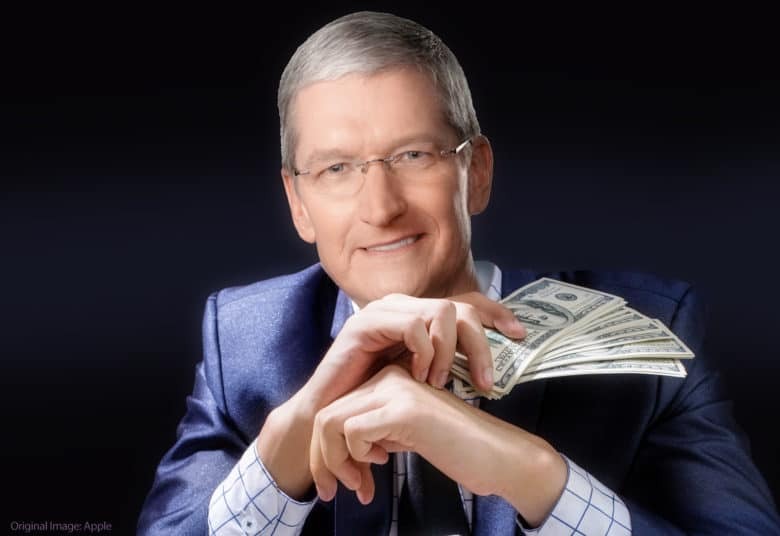 Earlier this month, Cook gave 23,215 Apple shares to an unspecified charity. At the current AAPL trading price, that’s almost $5 million.